Industrial kitchen supplies need to fulfill different demands than the regular home kitchen gadgets, because they have to produce food items continuously and on large scale. Therefore their standards are altogether unique. A lot of factors should be taken into consideration while choosing industrial kitchen supplies. Energy efficiency is the most important amongst these factors. 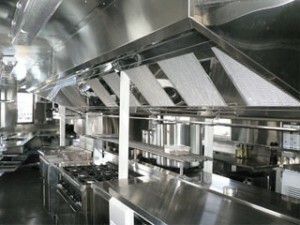 The kitchen of an industry makes up the largest share of its energy bill, i.e. nearly 43% to 48%, in which the share of food preparation is about 30%, while that of refrigeration is about 13% to 18%. Apart from refrigerators, HVAC systems and exhaust hoods have a major share in the energy consumption of an industrial kitchen. It is encouraging that there is a growing awareness about the energy-efficient industrial kitchen supplies and numerous businesspersons are inclined towards using these supplies. Purchase of Energy Star labeled gadgets is increasing. Plus there are some organizations which have established excellent tests to figure out the efficiency of industrial kitchen supplies. Though a small range of equipment is tested under these tests, researches are continuously going on and soon tests will be available for larger range of gadgets, which will include griddles and ovens. Therefore there are hopes that in near future, industrial kitchen supplies will be manufactured with not only quality, but also energy efficiency in mind. It is also encouraging that the local authorities and organizations have begun a tax or price rebate program for the purchasers of energy efficient gadgets. You should check if any such rebate program is operated in your locality, if you are in food industry. Actually, if you are starting the business newly, this should be your first lookout. Energy efficient industrial kitchen supplies save your lots of money spent on energy and water consumption yearly, though they cost just as much as the regular kitchen supplies. You can even replace repeatedly failing equipment with an energy-efficient one. The gadgets you can find, which undergo the water and energy efficiency tests, or have Energy Star labels, include steam cookers, oven, convection ovens, griddles, insulated holding cabinets, fryers, hot food holding cabinets, walk-in coolers, freezers, refrigerators, ice machines, and so on. They save a lot of energy and water; e.g. A low-flow pre-wash sprayer requires less than two gallons of water per minute, which is far less than the 6 gallons required by the conventional one. A water-heater in an industrial kitchen consumes 11% to 18% of the total energy required annually by the business. Electric heaters are more energy efficient than those which work on natural gas. So are the solar heaters. Maintaining the kitchen supplies is also very important, so that, their need of energy is decreased considerably. Refrigeration especially needs to be cleaned and maintained very carefully, because it forms about 13% to 18% of the energy bill. If the coils on its compressors accumulate dirt, cooling units are compelled to work harder and take much time to keep the box cool. Because of this, a lot of energy is consumed; moreover it leads to compressor failure and that costs a lot of money to repair. Condenser fins and coils need a clean-up once in a month and a quick dusting every week brings about a lot of benefit. 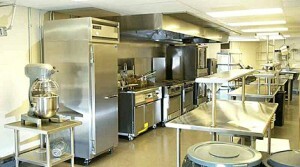 Thus using energy-efficient industrial kitchen supplies and observing an overall clean-up and maintenance saves your lot of money.